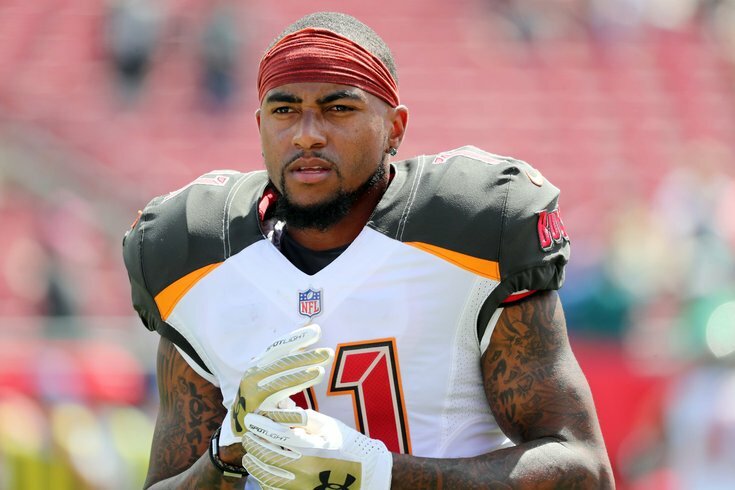 Wide receiver DeSean Jackson works out prior to the game against the Philadelphia Eagles, the team who traded for him this offseason. It didn't take very long, but NFL free agency has cooled off quickly. And with a month still remaining before the 2019 NFL draft, things are looking good for Howie Roseman and the Eagles. After entering this offseason with almost no money to spend, Roseman has not only been able to free up quite a bit of space, but he's also been able to make solid moves with those dollars, whether that means signing Malik Jackson or trading for (and then extending) DeSean Jackson. If you haven't read Jimmy Kempski's NFC East free agency grades, I highly recommend checking out the grade he gave to New York. Let's just say Dave Gettleman won't be hanging it on his refrigerator. The Eagles submitted a rule proposal to the NFL's competition committee that would change a longstanding holiday tradition: they don't want the Cowboys and Lions to play at home every Thanksgiving. In short, every team in the NFL is required to play one Thursday Night Football game per season, and playing those games on the road is a huge disadvantage. But because the Lions and Cowboys were the first two teams to agree to play on Thursdays — and became a Thanksgiving staple in the process — they've been guaranteed to play their Thursday game at home every year. And that's an unfair advantage. Before the rule change could be voted on, however, the Eagles withdrew their proposal. But why? The Eagles got Vinny Curry for a steal. According Zangaro, his one-year deal is worth a max of $3.5 million, but only $2.25 million guaranteed (the other $1.25 million is incentive-based). Considering he signed with the Bucs last offseason for a deal worth an average of almost $8 million per year, that's quite a bargain. But the best part might be the fact that he turned down a better offer from the Giants in order to return "home." But this wasn’t all about money for Curry. He wanted to come back. You could feel his excitement on the other end of Thursday’s conference call. In fact, Curry was reportedly offered more money to join the Giants, but came back to the Eagles instead. The Eagles may have added a veteran backup in Vinny Curry, but they also lost a key contributor to their defensive line from last season when they traded Michael Bennett to the Patriots. Danny Kelly of The Ringer listed that addition by the Patriots as one of "The Best Bang-for-Your-Buck Moves of NFL Free Agency." I’m not sure how the Patriots always seem to add top-quality veteran players for pennies on the dollar, but here we are again. New England acquired Philly pass rusher Michael Bennett for a late-round swap of 2020 picks (the Eagles send their 2020 seventh-round pick along with Bennett in exchange for the Patriots’ 2020 fifth-round pick), adding a still-dominant pocket disruptor to fill the role of the recently departed Flowers for what amounts to peanuts. Sure, the Eagles have done a good job in free agency so far, but they've failed to address one of their most glaring holes, running back. Right now, the Eagles just don't have enough there. And while they could add some talent via next month's draft, it's going to be difficult to add any proven talent between now and next season. As it stands, the Eagles running backs are Corey Clement, Wendell Smallwood and Josh Adams. Jay Ajayi is a free agent and is testing the waters — he recently visited with the Colts but left without signing a deal. And it's still unclear whether or not Darren Sproles plays at all in 2019. As C.J. Anderson waits for his next opportunity, the Eagles could be waiting patiently to strike. Right now, there’s a chance that the Eagles get Jay Ajayi back on a short-term deal, but I believe Ajayi is still searching for a different situation. As he visited the Indinapolis Colts earlier in the week, Ajayi seems to be open to moving on from Philly as he may not see a long-term future there knowing they will most likely draft a running back.